Hip No. 316, Black Canary, a bay filly by War Front consigned by Woodford Thoroughbreds, Agent, went to Justin Casse, Agent, for $425,000 to top the second session of the Ocala Breeders’ Sales Company’s 2016 June Sale of Two-Year-Olds and Horses of Racing Age. A half sister to stakes placed Joe Tess out of graded stakes placed Forty Moves, by Gold Fever, she breezed an eighth in :10 flat at the Monday session of the Under Tack Show. Nick J. Hines, Agent, paid $370,000 for Hip No. 484, a bay colt by Candy Ride (ARG) consigned by Bobby Dodd, Agent. Out of La Maestranza, by Storm Cat, a daughter of grade one winner Cash Run and full sister to stakes winner Great War Eagle, his eighth in :10 flat was co-fastest at the distance at Tuesday’s Under Tack session. Hip No. 476, Letsgoidaho, a bay colt by Uncle Mo who breezed an Under Tack eighth in :10 4/5, was sold to Michel Everett for $350,000. Consigned by Classic Bloodstock LLC, Agent, he’s out of Lady Mocha, by Tale of the Cat, a full sister to graded stakes placed stakes winner Resplendency. Charles J. Cella went to $260,000 for Hip No. 310, a bay colt by Shackleford out of Flashy Future, by Bertrando, a full sister to grade one stakes placed stakes winner Lacquaria. Consigned by RiceHorse Stables, Agent for Emerald Sales LLC, he turned in an Under Tack eighth in :10 flat. Hip No. 413, a son of Quality Road consigned by Wavertree Stables, Inc. (Ciaran Dunne), Agent, was sold for $160,000 to Alistair Roden Bloodstock. The bay colt, who breezed an eighth in :10 1/5 at the Under Tack Show, is out of champion Inish Glora, by Regal Classic, and is a half sister to stakes winner Roan Inish as well as a full sister to graded stakes placed In Equality. Gary Young, Agent, paid $130,000 for Hip No. 404, a chestnut colt by Candy Ride who worked an Under Tack eighth in :10 1/5. Consigned by de Meric Sales, Agent, he’s out of graded stakes placed stakes winner Humble Janet, by Humble Eleven. Gary Young also went to $120,000 for Hip No. 428, a daughter of Dialed In consigned by RiceHorse Stables, Agent for Emerald Sales LLC. The chestnut filly, who breezed a quarter in :21 3/5 at the Under Tack Show, is a half sister to stakes placed Resortes out of Iyieldtonoone, by High Yield, a daughter of graded stakes winner Miroswava (FR). Hip No. 324, a son of Colonel John consigned by Eisaman Equine, Agent, was sold to Dennis O’Neill for $120,000. The bay colt is out of stakes winner Friendofthefamily, by Wild Rush, a half sister to graded stakes winner Commanche Trail. Hip No. 306, a bay filly by Pure Prize consigned by Costanzo Sales, was purchased by E. L. R. Corp. for $105,000. A full sister to stakes placed Faerie Queene out of Firm Affair, by Colonial Affair, she worked an eighth in :10 1/5 at the Under Tack Show. 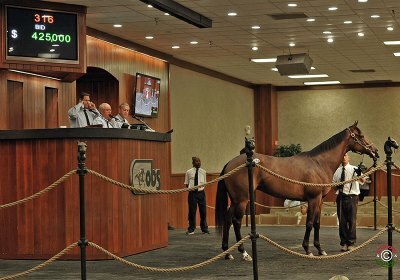 For the session, 146 horses sold for a total of $4,828,400, compared with 158 bringing at total of $5,931,300 at last year’s second session. The average was $33,071 compared with $37,540 in 2015 while the median price was $15,500 compared to $20,000 a year ago. The buyback percentage was 27.7%; it was 23.7% last year. The June Sale continues Thursday at 10:30 a.m. Hip No.’s 601 – 900 will be offered.